Save an additional CDN$50.00 when purchased with a Tempra or Tempra Plus. To order your filter at the discounted price with your Tempra or Tempra Plus purchase, add the water heater you want to buy to your shopping cart first. You will then be given the option to add accessories at the special discounted price! ecoTAC Protector Series water filters prevent mineral scale from accumulating in your water heater, thereby ensuring optimal performance of your heating elements / heat exchanger; also, these filters reduce the risk of pre-mature equipment failure and maintain optimal flow performance. Simple operation with no day-to-day maintenance - just replace the filter cartridge every 2 years! No salt, no chemical regeneration, and no brine discharge! Hard water minerals (primarily calcium and magnesium) rob your water heater of its energy efficiency by building up on its heating elements and heat exchanger surfaces. They effectively provide a layer of insulation between the heating surface and the water, thereby reducing heat transfer and putting extra stress on the heating element. Over time, the accumulation of minerals will also reduce water flow (particularly in tankless water heaters) and will lead to "hot spots". These "hot spots" cause premature failure of the heat exchanger which results in costly repairs not covered under manufacturer warranties. 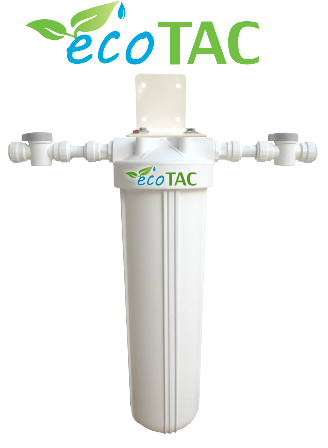 ecoTAC Protector Series filters will provide benefits where the hardness of the water exceeds 7 grains per gallon or 120 ppm (mg/l), and is strongly recommended where the hardness exceeds 12 grains per gallon or 200 ppm (mg/l). Install on the cold water line prior to your tankless water heater. Can install 2 or more in parallel flow configuration for higher flow rate applications. Long life TAC media cartridge - Media Made in U.S.A.
John Guest brand inlet and outlet shut-off valves - Made in U.K.
John-Guest brand quick connect-style fittings (3/4" inlet/outlet) - Made in U.K.
Chlorine < 3 ppm (mg/l) - city water OK!